OXFORD DIECAST 76SM003 1 76 OO SCALE Sherman MKII 18 Arm.Reg -4th Nz Arm.Brg. 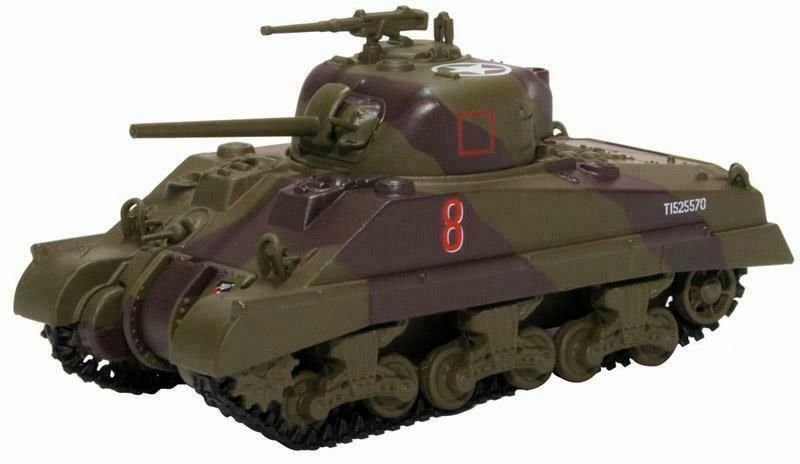 OXFORD DIECAST 76SM003 1:76 OO SCALE Sherman MKII 18 Arm.Reg -4th Nz Arm.Brg. The US Sherman tank is as deployed by the 4 th New Zealand Armoured Brigade in the Italian Campaign in 1944. The Brigade was formed in October 1942 and before moving up to Italy, had seen action in Greece, Crete and in North Africa. Arriving in Italy in October 1943, the Brigade now included the 18 th Armoured Regiment as well. The regiment had over 50 Sherman tanks in both turret and unturreted configurations. Note that this model has the addition of a rear turret box for this release. The New Zealand brigade was engaged in both central Italy and the Adriatic coast, including the Battle of Monte Cassino.